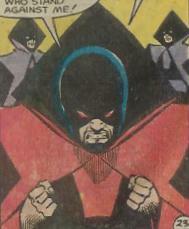 Powers/Abilities: The Black Abbott possesses many mental abilities, including telepathy, low-range mental control, psychic blasts and telekinesis. He can control many subjects at once, and in the process, they act as near-duplicates of him, in speech and thinking. The Black Abbott can project a sort of energy from his hands that can reduce a living human into nothing but ash. 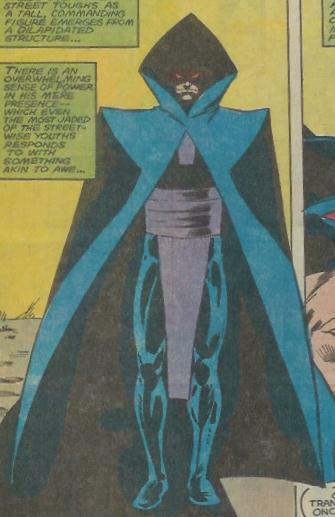 (Marvel Team-Up I#148 (fb)) - The man who would become the Black Abbott was one of many nameless Monks of Dakoth-Kuru, a sect that had managed to use their teachings to unlock the full potential of their minds, giving them incredible mental powers. One, however, had more powers, the ability to control the twelve others and use them to act as "limbs" of his. Taking control of the entire brotherhood, the Black Abbott sought ultimate power. (Marvel Team-Up I#146-BTS) - One of The Black Apostle posing as him hired the Taskmaster to gather a large number of local gang members together to be trained to work with him. While assembled, they were disrupted by Nomad and Spider-Man, who were chasing a young thief (the brother of one of the gang members). 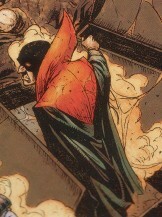 Taskmaster easily captured Nomad, while the false Abbott waited for Spider-Man to get within range, then blasted him with a psychic bolt, knocking him unconscious. When one of the gang members decided that he wanted no part of something involving super-heroes, the Apostle attempted to mentally change his mind, but failing, opted to reduce the man to ash instead. Just as he was about to do the same to Spider-Man, a groggy Nomad grabbed Taskmaster's shield (a copy of Nomad's partner's, Captain America) and threw it between them. The backlash caused the Black Apostle to burn his own hand off. With the heroes fighting off the gangmembers, the "Abbott" retreated to tend to his wound. (Marvel Team-Up I#147) - After one of the Abbott's underlings broke his mental control, he sought to escape in one of the Abbott's jet-crafts, but was pursued above the streets of New York by those still loyal to their leader. This man was rescued and taken to the hospital by the Human Torch. The same Apostle who confronted Spider-Man and Nomad took on the guise of the elderly Mr. Abbott, and visited Peter Parker, hoping to use his mind-powers to take control of Parker and force him to work on the Abbott's super weapons (which were under the guise of the World Peace Association's work). When he mentioned that Parker's former friend Steve Hopkins recommended him, Parker played along to find out what happened to Steve. In the meantime, the Torch had gained information from the man he saved and headed to the Abbott's headquarters, where Parker had just arrived and had begun to search the place as Spider-Man. After the Torch was captured, Spider-Man managed to break the Abbott's brainwashing on the hero. The two heores confronted the man they believed to be the Black Abbott, but were surprised to find two of him , both of whom unleashed a psychic attack on Spider-Man. One left to escape, but the one-armed Apostle stayed behind, only to be knocked out and captured. Miles away, the true Black Abbott plotted revenge. (Marvel Team-Up I#148) - Spider-Man visited the hospital where the man he believed to be the Black Abbott was being held, arriving just before two of the Abbott's ships arrived to kill the Apostle. This attracted the attention of Thor, and the two heroes fought off the minions. The one-armed man awoke and begged for help, explaining that he'd been freed from the Abbott's control during his previous fight with Spider-Man and that the true Black Abbott was still out there. The Black Abbott recalled his Apostles, except for two still in the Middle East, and managed to take control of the armless Apostle again. Thor, believing the man was still under free will, took him to the seminary where the Abbott was based. Thor was attacked by the Apostles, including the one that he had brought with him. The Abbott, seeing Thor, decided he could become a god upon earth if he could imbue Thor with his consciousness. However, he was rescued by Spider-Man, and Thor used his storm powers to cause a terrible fury that knocked all of the Apostles out. Mentally shocked by the backlash, the Abbott made his escape. (Captain America I#394 (fb) - BTS) - The Red Skull's Scourge of the Underworld reported to his leader that the Black Abbott was among his successful kills. (Punisher VII#5) - Aided by Dormammu's dark magic, the Hood resurrected the Black Abbott along with several other of Scourge's victims to fight the Punisher. (Punisher VII#6) - The Hood addressed the assembled resurrected villains (including the Black Abbott), warning them that failure to kill the Punisher would leave them dead again after 30 days, but lying to them that it was the Punisher disguised as Scourge who had killed them. Each one resurrected had been augmented, armed and costumed by the Hood, especially the Black Abbott. (Punisher VII#8) - With Mirage's help, the Black Abbott was disguised as one of the (1980s era) Avengers (hopefully Dr. Druid) as part of an elaborate masquerade to engage the Punisher, but the vigilante saw past the ruse and incapacitated him. Bird-Man took him and Mirage away from the battle zone. Comments: Created by Cary Burkett, Greg LaRocque and Mike Esposito. Obviously, there's a very good possibility that Scourge only murdered a new Apostle, or even one of the two that were not present at the final showdown, believing him to be the true Abbott. 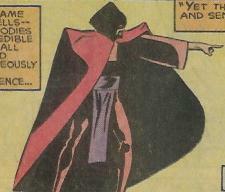 His new costume post-resurrection is somewhat unrecognizable - it seems to be a red (later black) robe with two metal clasps, similar to the Hood's cloak. The 30-day deadline given by the Hood (assuming he was telling the truth) was likely voided when Daken brutally killed the Punisher soon after in another title. Bud Abbott, partner of Lou Costello. 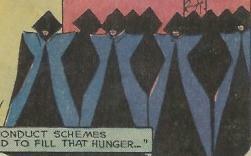 Twelve members of the Monks of Dakoth-Kuru, they were subjected to the Black Abbott's mental powers and turned out upon the world, posing as the true Black Abbott. One confronted several heroes, losing an arm in the process. Due to their training, they have most of the powers shared by the Abbott.